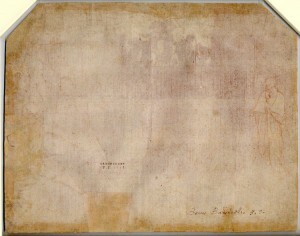 Recto: Red chalk, heightened with white (partly oxidized); verso: red chalk; 25.7 x 32.7. While the black on the recto in the upper part of the central figures appears to be oxidation, the black in the group above may be black chalk. Inscribed in ink on the verso in an old script: Baccio Bandinelli 5.3. PROVENANCE: Sir P. Lely (Lugt 2092). Rev. C. M. Cracherode Bequest, 1799. Kusenberg, 1931, 134, 142-143, no. 53, as Rosso, around 1517. A. E. Popham, A Handbook to the Drawings and Water-colours in the Department of Prints and Drawings, British Museum, 1939, 30, as clearly by Rosso. Barocchi, 1950, 226-227, n. 3, with no opinion given. Carroll, 1964 (1976), II, Bk. 2, 492-493, F. 36, 535-536, Bk. 3, Fig. 188, as Bandinelli, around 1516. Carroll, 1971, 26, 35, ns. 31-32, as Bandinelli in the second decade of the sixteenth century. Turner, 1986, 154-155, no. 112, with Color Pl., as Rosso, “albeit with some caution,” around 1517, and related to Bandinelli. Ward, 1988, 36, under no. 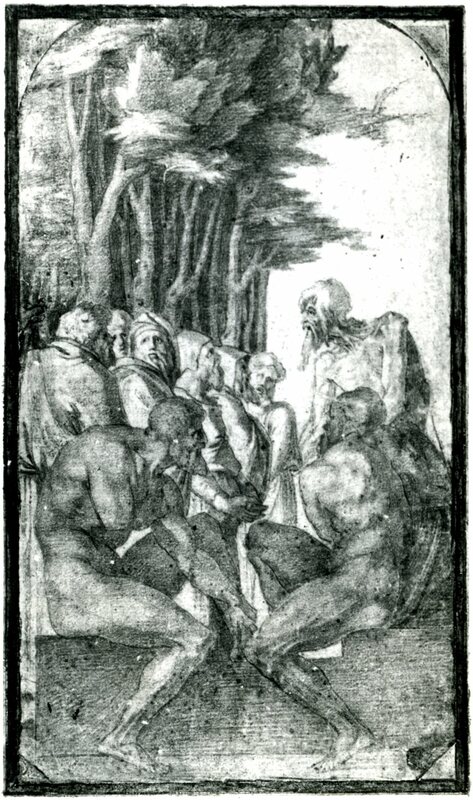 15, as a prime example of Rosso’s drawings, and like the Chatsworth drawing to which it is related [RD.3], done when Rosso was most influenced by Bandinelli in the months prior to the sculptor’s departure for Loreto, where he was no later than April 1, 1518. 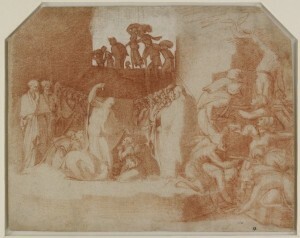 Cox-Rearick, 1993, 388, n. 15, as Rosso, as apparently showing Moses and the Israelites in the desert and which might also show, at the right, Moses striking the rock, noting that in the early 1520s Pontormo did a series of drawings for an unexecuted scene of the Israelites drinking water. Jaffé, 1994, T and U, 90, under no. 58 (712), as Rosso. Franklin, 1994, 275, n. 50, as not by Rosso, and best placed with Bandinelli and his circle along with the (so-called) Skeletons [D.1] and the Preaching of St. John the Baptist at Christ Church [RD.25]. 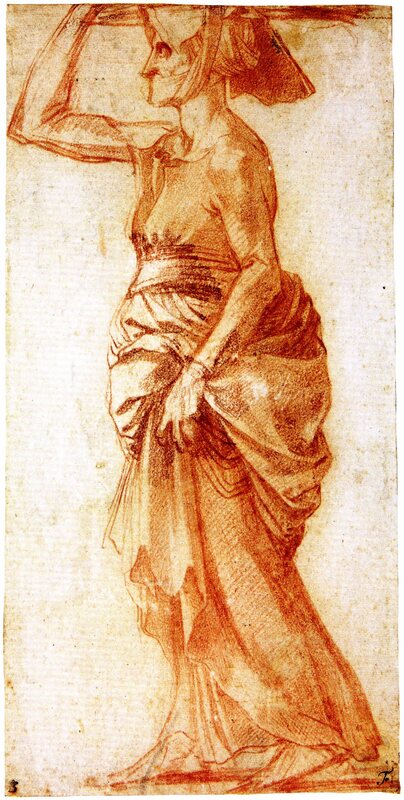 Ward described the drawing as apparently showing a conflation of “episodes from the Old Testament account of the Israelites’ wanderings in the Wilderness of Sinai.” He believed, as I do, that it can be associated with the drawing at Chatsworth of a Draped Old Woman Carrying a Bundle on Her Head (Fig.RD.3). But whereas I thought the London drawing was by Bandinelli, to whom it had been attributed before Kusenberg gave it to Rosso, Ward thought it was by Rosso under the influence of Bandinelli. We both had thought it was done in the second half of the second decade of the sixteenth century, around 1516-1518. As I discussed under RD.3, I now believe the Old Testament Scene, and the Chatsworth drawing (Fig.RD.3) that Ward also attributed to Rosso, were done considerably later, probably around 1547-1548 when Bandinelli was making plans for the Old Testament reliefs for the recinto of the choir of the cathedral of Florence. Thematically it is related to Bandinelli’s Scene of Exodus, Uffizi 504F recto (Fig.Bandinelli, Exodus), that Ward, following Forlani, associated with this project (see RD.3). 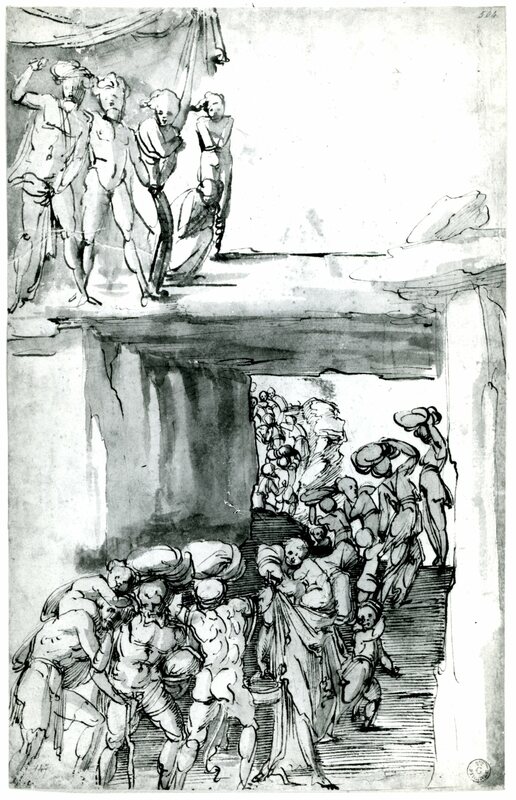 Both scenes show similar figures fleeing with bundles on their heads through a rectangular opening in the distance (although Ward thought the Uffizi drawing depicts a scene related to The Deluge). 1 On the drawing formerly in the Clinton Collection, to which I related the Old Testament Scene in 1964, as did Turner in 1986, see RD.18. 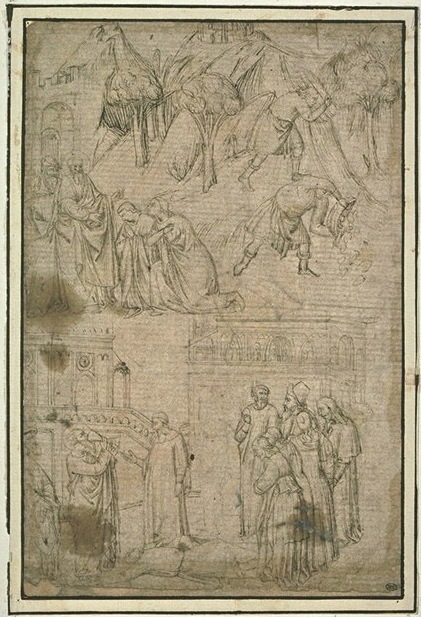 The rows of standing figures as well as their stances, drapery, and physiognomies in both the British Museum drawing and the Clinton drawing have similarities to these aspects in two pen drawings mounted together at the Louvre under Anonymous Florentine, XVIth century, Scene with Twelve Figures, Inv. 2709, 13.2 x 15.3 (Fig.Paris, 2709), and St. John Drinks the Chalice of Poison Before Emperor Domitian, Inv. 2709 bis, 13.7 x 18.1 (Fig.Paris, 2709 bis), inscribed on the back of the mount: plutôt Bandinelli (Pouncey), Cf. 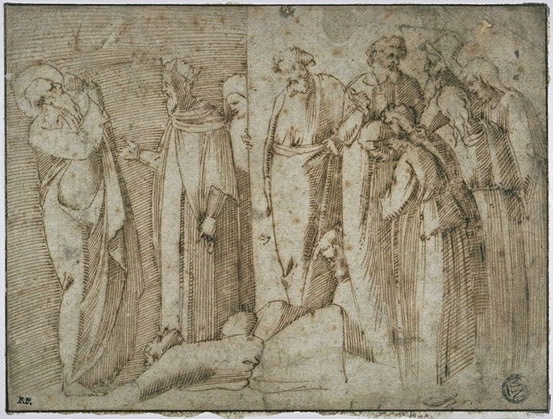 pour la composition le dessin 001251 attribué à Giotto (Fig.Paris, Inv. 1251 recto). Aspects of both pen drawings are related to the two scenes depicted on Inv. 2709 recto, but with many differences, suggesting another similar source. 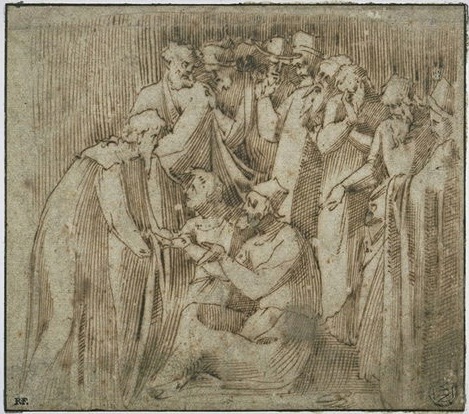 Included here should be the drawing at Christ Church, Oxford (Fig.RD.25), possibly depicting the Preaching of St. John the Baptist. Herein lies the evidence of a consideration by sixteenth century artists of the work of their Trecento predecessors. The artists and the period in which this reflection on the past took place will require extensive research to plot out its course, its extent, and its significance. That this is an episode of the second decade of the sixteenth century or of the 1540s, when Vasari was writing his Lives, has yet to be discovered.